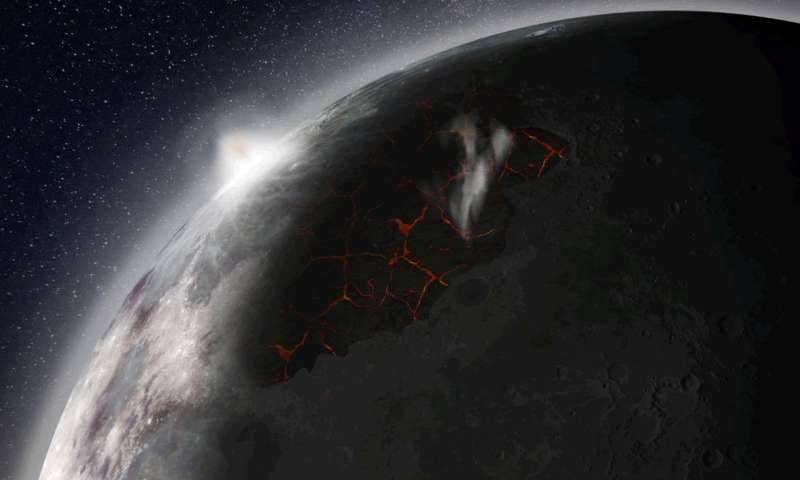 A new study shows that an atmosphere was produced around the ancient Moon, 3 to 4 billion years ago, when intense volcanic eruptions spewed gases above the surface faster than they could escape to space. The study, supported by NASA's Solar System Exploration Research Virtual Institute, was published in Earth and Planetary Science Letters. When one looks up at the Moon, dark surfaces of volcanic basalt can be easily seen to fill large impact basins. Those seas of basalt, known as maria, erupted while the interior of the Moon was still hot and generating magmatic plumes that sometimes breached the lunar surface and flowed for hundreds of kilometers. Analyses of Apollo samples indicate those magmas carried gas components, such as carbon monoxide, the ingredients for water, sulfur, and other volatile species. In new work, Dr. Debra H. Needham, Research Scientist of NASA Marshall Space Flight Center, and Dr. David A. Kring, Universities Space Research Association (USRA) Senior Staff Scientist, at the Lunar and Planetary Institute (LPI), calculated the amounts of gases that rose from the erupting lavas as they flowed over the surface and showed that those gases accumulated around the Moon to form a transient atmosphere. The atmosphere was thickest during the peak in volcanic activity about 3.5 billion years ago and, when created, would have persisted for about 70 million years before being lost to space. The two largest pulses of gases were produced when lava seas filled the Serenitatis and Imbrium basins about 3.8 and 3.5 billion years ago, respectively. The margins of those lava seas were explored by astronauts of the Apollo 15 and 17 missions, who collected samples that not only provided the ages of the eruptions, but also contained evidence of the gases produced from the erupting lunar lavas.NASA's Needham says, "The total amount of H2O released during the emplacement of the mare basalts is nearly twice the volume of water in Lake Tahoe. Although much of this vapor would have been lost to space, a significant fraction may have made its way to the lunar poles. This means some of the lunar polar volatiles we see at the lunar poles may have originated inside the Moon." David Kring notes, "This work dramatically changes our view of the Moon from an airless rocky body to one that used to be surrounded by an atmosphere more prevalent than that surrounding Mars today." When the Moon had that atmosphere, it was nearly 3 times closer to Earth than it is today and would have appeared nearly 3 times larger in the sky. This new picture of the Moon has important implications for future exploration. The analysis of Needham and Kring quantifies a source of volatiles that may have been trapped from the atmosphere into cold, permanently shadowed regions near the lunar poles and, thus, may provide a source of ice suitable for a sustained lunar exploration program. Volatiles trapped in icy deposits could provide air and fuel for astronauts conducting lunar surface operations and, potentially, for missions beyond the Moon. Over the past decade, the search for volatiles within the Moon and on the surface of the Moon has intensified. Those volatiles may hold clues about the material that accreted to form the Earth and Moon and, thus, our planetary origins. The volatiles may also provide the in-situ resources needed for sustained lunar surface activities that may follow the development of NASA's new Orion crew vehicle and a Gateway structure that may orbit the Moon. In addition, robotic assets, like NASA's Resource Prospector, are being developed to explore the nature and distribution of volatile deposits that might be suitable for scientific analysis and recovery. Based on the new results of Needham and Kring, those assets may be recovering ice that is partially composed of volatiles erupted from volcanic fissures over 3 billion years ago.